2 PCS 10.1 Inch 1024600 TFT LCD HD Resistance Touch Screen Car Headrest Monitor DVD Player 32 Bit Game HDMI/USB/SD/IR/FM Enterance. 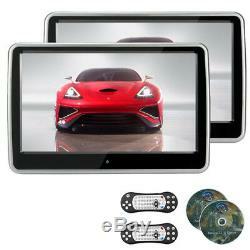 10.1 inch Digital TFT LCD Touch Screen. Pixel: 1024(W) × 600(H). Color system: PAL/NTSC (auto search system). Power supply: DC 12V (7V-15.8V). Built-in 32 bits wireless games Function, with Game Disc. Built-in 2.0 USB port/SD. English, French, Spanish, Chinese, Japanese, German, Italian. 2 way AV input/1way AV output. 2 Remote Controller (without Battery). 2 Car Cigar Lighter Power Adapter. All items will be checked before packing. All items are new and of high quality. We will reply you within 24- 48 hours. The item "2pcs 10.1'' TFT LCD Touch Screen Headrest DVD Player IR/FM/Speaker DVD/VCD/MP3" is in sale since Thursday, November 2, 2017. This item is in the category "Vehicle Parts & Accessories\Car Parts\Interior Parts & Furnishings\Other Interior Parts & Trim". The seller is "goodserviceliu" and is located in CN. Feature 4: Compatible with DVD/VCD/MP3/JPEG/RMVB/CD-R/CD-RW/SVCD/DIVX etc.